Drawing from her classroom and field experience, Jeane W. Anastas, PhD, LMSW, merges the "practice wisdom" of today's social work educators with contemporary theories on instruction and learning. 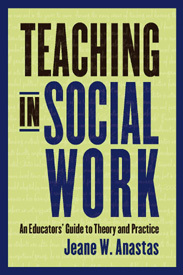 Built around a teacher- and student-in-situation framework, Teaching in Social Work examines the effect of social issues, professional norms and needs, and various educational settings on the interactions among educators, students, and the subjects they learn. The result is a singular volume that focuses specifically on teaching within the field of social work, identifying the factors that result in effective educational outcomes. Anastas draws on the theories and selected research findings of higher education and social work education literature. She illuminates the critical aspects of teaching and learning as an adult, the best uses of different modalities of instruction, and the issues of diversity that influence all aspects of teaching and learning. Her book includes guest-authored chapters on field learning and the latest advances in teaching technology. It also engages with ethics, teaching and learning assessments, and faculty work in full-time social work education.